Steven Lee's school trip to China doesn't go quite as expected. For one thing, he feels lost in a place where people expect him to feel at home. For another, a lot of the cooler museum exhibits are empty. 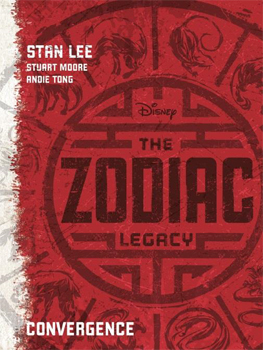 And, oh yeah – he stumbles upon ancient pools filled with powers connected to the Chinese Zodiac. And then there's the Vanguard, the corrupt organization in the middle of a dangerous ritual to harness those powers. After unknowingly receiving the powers of the Tiger, complete with super strength and killer reflexes, Steven finds himself joining a ragtag group bent on stopping the Vanguard. Steven may be a quick-thinking fourteen year-old who can punch through walls, but the might of the Vanguard is unlike anything the world has ever seen. Or so the Vanguard would like to think. Stan Lee is known to millions as the man who's Super Heroes propelled Marvel to its preeminent position in the comic book industry. His co-creations include Spider-Man, The Avengers, X-Men, Iron Man, The Incredible Hulk, The Fantastic Four, as well as hundreds of others. He introduced Spider-Man as a syndicated newspaper strip that became the most successful of all syndicated adventure strips and has appeared in more than 500 newspapers worldwide. Stan currently remains Chairman Emeritus of Marvel, as well as a member of the Editorial Board of Marvel Comics. Stuart Moore has been a writer, a book editor, and an award-winning comic's editor. His recent writing includes Civil War, the first in a new line of prose novels from Marvel Comics; The Art of Iron Man 3 (Marvel, with Marie Javins); THE 99, a multicultural super hero comic from Teshkeel Media; and Disney World wide's John Carter: The Movie Novelisation. His other writing includes Web of Spider-Man, Wolverine Noir, and Namor: The First Mutant (Marvel); Firestorm (DC Comics); assorted Star Trek and Transformers projects (IDW Publishing); Stargate Atlantis (Avatar), and the original science-fiction graphic novels Earthlight (Tokyopop), PARA, and Shadrach Stone (both Penny-Farthing Press). Andie Tong started off as a multimedia designer in 1997 and eventually migrated full time to comics in 2006. Since then he has worked on titles such as Tron: Betrayal, Spectacular Spider-Man UK, The Batman Strikes, Smallville, Wheel of Time, TMNT, Masters of the Universe, and Starship Troopers, working for companies such as Disney, Marvel, DC Comics, Panini, Dark Horse, and Dynamite Entertainment, as well as commercial illustrations for numerous advertising agencies including Nike, Universal, CBS, Mattel, and Hasbro. When he gets the chance, Andie concept designs for various companies, and also juggles illustration duties on a range of children's picture storybooks for Harper Collins.